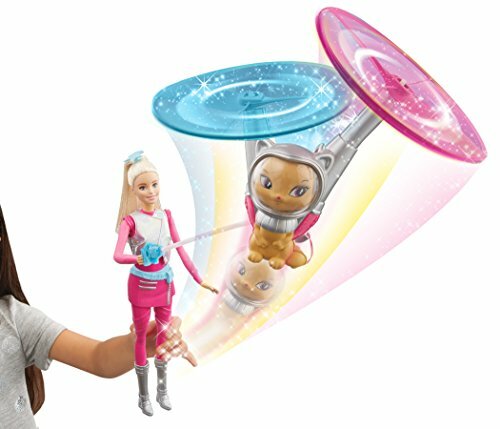 Travel through space with Barbie and her pet with the Barbie Star Light Galaxy Barbie Doll and Flying Cat. Hurry and get the Barbie Star Light Galaxy Barbie Doll & Flying Cat today for only $12.28 from Amazon! This doll is usually $24.99! Join Barbie doll and her flying cat on a sparkling adventure through space! Inspired by the movie Barbie Star Light Adventure, Barbie doll’s adorable pet really flies! Based on the space fantasy movie Barbie Star Light Adventure, galaxy Barbie doll and her flying cat take storytelling out of this world! Join them and travel through a galaxy of sparkling stars and colorful characters. Recreate the exciting action of these two companions, who embark on an adventure throughout the galaxy — training, traveling and saving the universe together. Barbie doll’s cat really flies to mimic the high-flying fun! Attach the cat’s leash to Barbie doll’s hand, and push the button on Barbie doll’s leg to spin the propellers on her cat. Watch the adorable animal lift into the air and begin to hover, raising the possibilities for excitement and storytelling! The star of the movie, Barbie doll, is ready for action in her signature pink molded jumpsuit. A shiny holographic vest, pink plastic skirt (with cool zipper details), blue utility belt and silvery boots are fashion-forward accessories. Silver streaks and a blue star hair clip atop her ponytail complete her look. Her cute cat matches with a silvery helmet (non-removable) and two pink-hued propellers. Recreate favorite scenes from the movie or let your imagination soar! Galaxy Barbie doll and her flying cat are ready to lift off into fun. Collect all of the dolls and accessories from Barbie Star Light Adventure to expand the storytelling possibilities to the ends of the universe (each sold separately, subject to availability). Includes Barbie doll wearing fashions and accessories and her flying cat with non-removable helmet and leash. Doll cannot stand alone. Colors and decorations may vary. Buy the Barbie Star Light Galaxy Barbie Doll & Flying Cat from Amazon.